The hotel has 127 rooms. 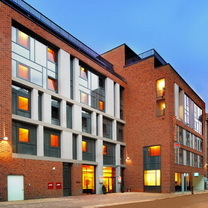 The newly built Star Inn Hotel Budapest Centrum is situated 400 meters from the Opera. The Parliament, St. Stephen's Basilica, Váci utca and the Chain Bridge are easily reachable on foot. Choose from modern standard and business rooms or treat yourself to a spacious suite. Wired internet is available in the entire Star Inn Budapest Centrum hotel free of charge. The new Star Inn Hotel is located right in the heart of Budapest, only some 400 m from the famous opera house. The hotel is easily reached from any direction - ideal for conducting your business in the Hungarian capital. Of course, there's much, much more to discover in this fantastic city: You'll be amazed at the grandiose architecture, the historic buildings, and the fascinating flair of the city. There are five different room types to choose from: 38 Standard Rooms, each 14 m² / 151 ft² in size with an individually controllable thermostat, shower/toilet, bath with hair dryer, 26" LCD TV with satellite reception, free LAN access, and a large double bed. Our 60 Business Rooms roughly 16 m² / 172 ft² in size are also furnished with a comfortable leather sofa. 20 Twin Rooms are also a good 14 m² / 151 ft² in size and are furnished with two single beds each. 7 suites, each roughly 35 m² / 377 ft² in size on the top floor of the building, have separate living rooms and bedrooms for your enjoyment. Furthermore the hotel is equipped with two handicapped accessible rooms. Paid parking is available, located beneath the hotel.